In a parallel discount to the CL1, the RHA DACamp L1 portable DAC/amp [the name gave it away] is now down to $240 with free shipping at Amazon by Amazon actual with up to three per customer at the sale price. It went for $255~ on sale before. With these two on sale, other RHA products may also be on sale, so if interested in any others, you may want to price-check them at Amazon…. Brookstone has a clearance sale and among the items they carry is RHA earphones. Among those on clearance is the new condition RHA MA750i in-ears going for $65~. YMMV on availability depending on when you check. Free shipping with orders of $75+ with coupon SHIP75 is on a banner at the top of their website, but coupon SHIP50 may also work and get you free shipping with orders of $50+. They also offer a 15% off coupon if you sign up for their emails but I don’t know if that coupon works with clearance items. There’s also coupon code PERK15 that’s $15 off orders of $75+ but I think that’s only for regularly priced items. There’s also coupon code WD8291 that may get you free shipping and/or discount depending on the combination of items. Our headphone traacking finally paid off! If you had been looking to find the new condition RHA CL1 ceramic in-ears in-stock and at a reasonable price, rejoice! They are in-stock and ship in 1-2 days for $218 with free shipping by Amazon actual with up to three pairs per customer. 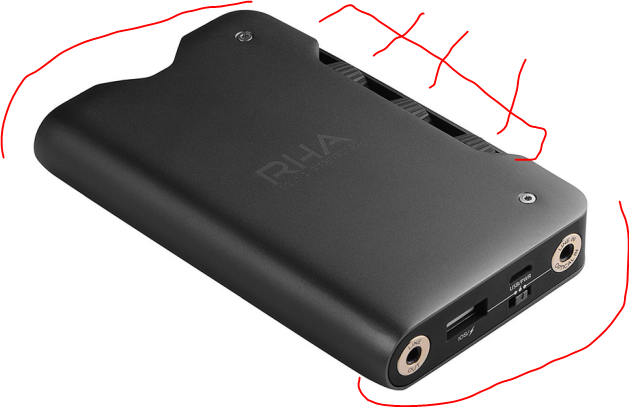 Speaking of RHA, continuing to be on sale is their RHA L1 DAC/amp for the very specific price of $255.52 by Amazon actual. Limit three per customer as well. Both the earphones and the DAC/amp come with a 3-year warranty, which is nice to see from a consumer perspective. The RHA CL1 in-ears are now orderable again at Amazon by Amazon actual at their previous sale price of $214~ with free shipping. However, the shipping estimate is currently “within 1 to 2 months”. This had previously been unorderable so this is definitely a good sign. If you are interested in this, mayhaps wait a couple of days to see whether Amazon has a more tangible estimate? As of 1/27/18 recheck, these are sold out again and cannot be ordered… Cancel the Nutella panic! If you had been chasing the RHA CL1 ceramic in-ears, they are back in-stock as of the time of writing, offered by the RHA Amazon store for $250 with free shipping. They ship directly from RHA and not Prime eligible. Amazon actual does not have them in-stock at the moment. These had gone as low as the $210s as far as I can recall. If you don’t have a Nutella urge to buy them right now, you may want to wait for them to get in-stock from Amazon actual and mayhaps go back to the $210s. Speaking of RHA, their RHA L1 DAC/amp continues to be on sale for $253. We have a discount! This is the first time I’ve seen it discounted, it is the new condition RHA Dacamp L1 dropping from $300 to $256~, sold and shipped by Amazon. Limit up to three units per customer at the sale price. Meanwhile their RHA CL1 ceramic in-ears remain steady at around $210. But they are running an Accessories Sale at the moment, which price-matches other people’s $180 sale on the V-Moda Crossfade Wireless (bluetooth) over-ears, but also has a sale that beats Amazon, the new condition RHA M600 In-Ears going for $50 with free shipping and free returns. The returns have arrived! The new condition RHA CL1 in-ears continue to be in-stock for $211, but if you prefer the way of the used, they have began to arrive at Amazon Warehouse Deals (AWD). As of the time of writing, there is a “Used – Very Good” condition listing with small scratches and damaged original packaging for $169 with free shipping by AWD actual. 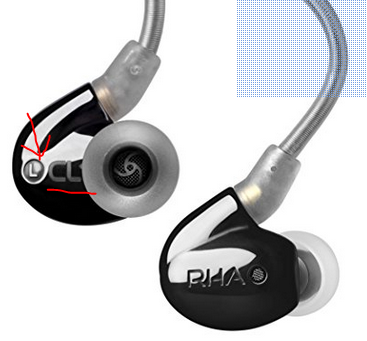 The RHA CL1 ceramic in-ears were in-stock for close to $220, then they run out, then their price went back up to $250. As of this recheck, they are back in-stock, and their price has now dropped to around $212, sold & shipped by Amazon actual. This is among the new headphones that are being tracked in Version II of the New Headphones Tracker that just went live today! We have a new arrival! The RHA Dacamp L1 is now in-stock and ready to ship for $300 with free shipping at amazon.com, offered at this price by Amazon actual (Prime eligible obviously) and by the RHA Amazon store (not Prime eligible). This has zero customer reviews at the moment. It comes with a 3-year warranty. It went out of stock for a bit, but as of the time of writing, the new condition RHA CL1 ceramic in-ears are back in-stock and ready to ship for $215~ at Amazon by Amazon actual. Speaking of monitoring in-stock situations, I am still keeping an eye out on the two clearanced Magni 2 head-amps. I will post updates if/when I spot them in-stock again. Ceramic time! No, this has not turned into a teaware blog 🙂 The RHA CL1 ceramic in-ears are back in-stock and ready to ship at Amazon by Amazon actual going for $215~ with free shipping. They have sMMCX connectors, moldable earhooks, and per the pictures, they come with a zippered case and various styles of eartips. … or if you are a fan of used, used prices start at $66~ in “Used – Good” condition, and there are more listings in “Used – Very Good” for $71~ at Amazon Warehouse Deals. The RHA MA750 (without mic/remote) goes for more in new condition options as of the time of writing, while the used prices are more of less similar. They are finally here! As of the time of writing, the new condition RHA CL1 ceramic in-ears are in-stock and ready to ship for the very specific price of $217.57 at Amazon by Amazon actual. You can buy as many as you want! Teaware is not the only thing that loves ceramics. RHA does too! Mayhaps the Scottish connection of tea and earphones? 🙂 That’s a question for the RHA engineers, in the meantime, their new CL1 ceramic earphones are about to start shipping! The current in-stock estimate at amazon.com is September 10 (2017), with a starting price of $250, sold and shipped by Amazon actual. UPDATE: Jack pointed out in the comments that there’s a big difference in price. This was announced at IFA 2016, a whole year ago for $450, which is the price at the RHA website as well. Amazon just recently added it to their website for $250. Price error? Newer model? Price drop? Amazon volume buy? Production and material costs went down? The RHA T10i in-ears are currently available in “Used – Acceptable” condition for $85~ by Amazon Warehouse Deals actual. There are no further details on the condition. This is the only used listing for these earphones. They average 4 out of 5 based on 170 customer reviews. A couple of RHA earphones are available for noticeably less in used condition at Amazon Warehouse Deals, and for each one there are multiple listings, so there the possibility of future price drops (other things equal). The used S500 start at $24~ in “Used – Good” and go to $26~ in “Used – Very Good”, and $27~ in “Used – Like New”. Meanwhile the model with a mic/remote, the used S500i go for $34~ in “Used – Very Good” and $36~ in “Used – Like New” conditions. This lightning deal expired… Among today’s action in the Gold box, the new condition RHA T20 In-Ears for $192~ with free shipping. The price before the sale was $240 last night when I posted the schedule. Offer ends by 7:14pm ET or earlier if sold out). The RHA T10i in-ears are currently available in “Used – Good” condition (cosmetic imperfections, damaged packaging) for $100~ by Amazon Warehouse Deals. The RHA MA750i in-ears are currently available in “Used – Good” condition for around $70 by Amazon Warehouse Deals or $75~ in “Used – Very Good” or $80 in “Used – Like New”. There are many many “Very Good” listings, so price pressure may force them further down (five pages of used listings over there as of the time of writing). These average 4.2 out of 5 based on 385 customer reviews but they share the listing with their parallel non-mic/remote (MA750). The RHA MA750i in-ears go for $130 in new condition, but if you are comfortable with buying used, you can get them for around $77 in “Used – Very Good” condition by Amazon Warehouse Deals (AWD). There are multiple pages of used listings by AWD, so price pressure may push the prices further down. The different listings have slightly different used descriptions, so check them to see which one may be the best match for your used gear risk matrix. 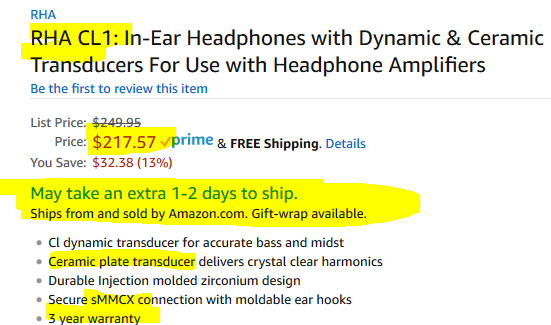 Note: these are on the same Amazon product listing as the MA750 (which does not have mic/remote as the lack of an “i” in its name hints at), so when clicking around, do pay attention to that. RHA itself (ships from MI) is offering new condition (unopened but dented packaging) RHA SA-950i on-ear headphones for $35 with free shipping thru Amazon.com. These ship from RHA, so everyone gets free shipping, however, they are not eligible for free 2-day prime shipping benefits. These average 4.2 out of 5 based on 77 customer reviews. They have a single-side detachable cable and the “i” in the model number indeed indicates an MFi product (made for iPhone/iPad/iPod with the familiar 3-button remote and mic combo). As of a 2/24/15 re-checking, this sold out at this used price… The RHA MA350 in-ears go for $40 in new condition, but you can get them for half the price in “Used – Very Good” condition at this point in time at Amazon Warehouse Deals. They average 3.9 out of 5 based on 174 customer reviews.